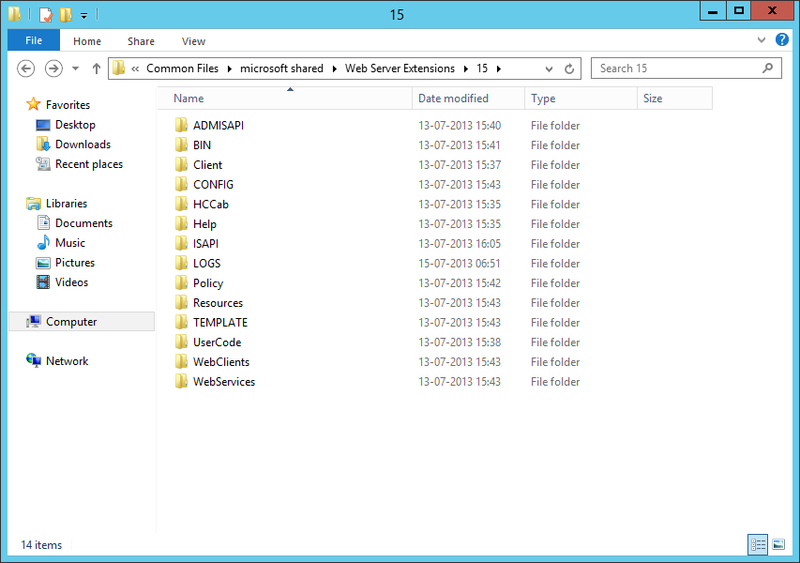 The 15 Hive is a special folder which is created during SharePoint 2013 installation. All the important files for supporting SharePoint framework like web.config, Features, Web Parts, User Controls, Help Files etc are stored in the SharePoint 2013 server file system inside the 15 Hive. The 15 Hive has a definite folder structure which holds the core SharePoint server files. Policy:- This directory contains SharePoint 2013 Server policy files. 1) C:\Inetpub\wwwroot\wss – This directory (or the corresponding directory under the Inetpub root on the server) is used as the default location for IIS Web sites. 2) C:\ProgramFiles\Microsoft Office Servers\15.0 – This directory is the installation location for SharePoint Server 2013 binaries and data. The directory can be changed during installation. 3) C:\ProgramFiles\Microsoft Office Servers\15.0\WebServices – This directory is the root directory where SharePoint back-end Web services are hosted, for example, Excel and Search. 4) C:\ProgramFiles\Microsoft Office Servers\15.0\Data – This directory is the root location where local data is stored, including search indexes. 5) C:\ProgramFiles\Microsoft Office Servers\15.0\Logs – This directory is the location where the run-time diagnostic logging is generated. This entry was posted in C#, Web Design. Bookmark the permalink.